PrismHR, the leading provider of cloud-based HR software for human resource outsourcing (HRO) companies including professional employment organizations (PEO) and administrative services organizations (ASO), announced new training and education offerings that help improve productivity and increase profitability. 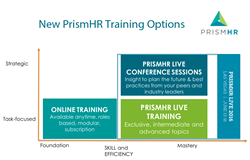 To learn more about PrismHR online training and view a free training sample, please go to http://www.prismhr.com/training. To learn more about PrismHR LIVE Conference and Training, visit http://www.prismhr.com/prismhrlive/. PrismHR creates exceptional software and services, empowering human resource outsourcing organizations such as Professional Employer Organizations (PEOs) and Administrative Service Organizations (ASOs) to deliver world-class HR, benefits and payroll to small and medium businesses. PrismHR powers more than 64,000 organizations, delivering payroll, benefits and HR to over 1.8 million worksite employees and processing greater than $50 billion in payroll each year. For more information, visit http://www.prismhr.com.